Dronedarone is used to treat patients with cardiac arrhythmias and has been reported to be associated with liver injury. Our previous mechanistic work demonstrated that DNA damage-induced apoptosis contributes to the cytotoxicity of dronedarone. In this study, we examined further the underlying mechanisms and found that after a 24-h treatment of HepG2 cells, dronedarone caused cytotoxicity, G1-phase cell cycle arrest, suppression of topoisomerase II, and DNA damage in a concentration-dependent manner. We also investigated the role of cytochrome P450s (CYPs)-mediated metabolism in the dronedarone-induced toxicity using our previously established HepG2 cell lines expressing individually 14 human CYPs (1A1, 1A2, 1B1, 2A6, 2B6, 2C8, 2C9, 2C18, 2C19, 2D6, 2E1, 3A4, 3A5, and 3A7). We demonstrated that CYP3A4, 3A5, and 2D6 were the major enzymes that metabolize dronedarone, and that CYP3A7, 2E1, 2C19, 2C18, 1A1, and 2B6 also metabolize dronedarone, but to a lesser extent. Our data showed that the cytotoxicity of dronedarone was decreased in CYP3A4-, 3A5-, or 2D6-overexpressing cells compared to the control HepG2 cells, indicating that the parent dronedarone has higher potency than the metabolites to induce cytotoxicity in these cells. In contrast, cytotoxicity was increased in CYP1A1-overexpressing cells, demonstrating that CYP1A1 exerts an opposite effect in dronedarone’s toxicity, comparing to CYP3A4, 3A5, or 2D6. 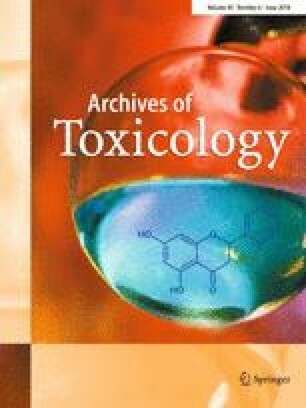 We also studied the involvement of topoisomerase II in dronedarone-induced toxicity, and demonstrated that the overexpression of topoisomerase II caused an increase in cell viability and a decrease in γ-H2A.X induction, suggesting that suppression of topoisomerase II may be one of the mechanisms involved in dronedarone-induced liver toxicity. This work was supported by U.S. FDA’s intramural grant program. This article is not an official guidance or policy statement of the U.S. FDA. No official support or endorsement by the U.S. FDA is intended or should be inferred.